Turn your Windows Phone into a mobile Point-of-Sale (mPOS). JUSP allows you to accept any credit, debit and prepaid card by paying 2.5% per transaction at no additional charge. Order your card reader JUSP online at www.jusp.com, download the app and connect the device to your phone. You can immediately accept payments. App optimised for Windows Phone 8.1. Choose to use Jusp in simple mode for a faster setup or in advanced mode for a faster checkout, and to get the most out of your business transactions. 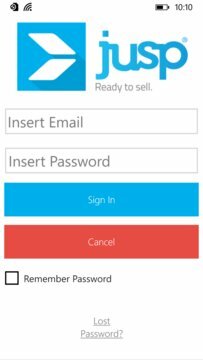 With the simple mode you can manually input the amount collected and send the purchase receipt to your customer via email or sms. You can also pair your device to a Bluetooth-compatible printer to print a paper receipt. - History: show payments history by date and export customised reports. 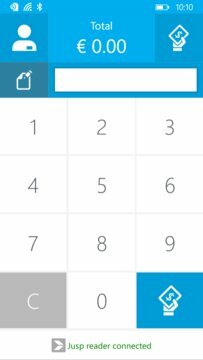 If you have problems or difficulties using the service you can contact Jusp’s support directly from the app in the menu PROFILE (the man icon top-left) - SUPPORT.